Did that title really say....Re-Upholster with paint? If you don't like to re-upholster, don't have the time or patience (I was dreading the tacks on this one), don't think you have the talent to tackle it and don't like or know how to sew, I have an answer for changing the chair you love and hate the fabric. Paint it...the fabric that is! Now I have to tell you, I tried this back in 1997 (I looked for the photo to scan in and couldn't find it). I didn't work very well. It was hard and crusty. Not very inviting to sit in. So I slip covered it and then it eventually made it's way to the trash. Earlier this week, Debi Beard (another CeCe Caldwell's Retailer) posted a video on painting a sofa with CeCe's Paint. Make sure you check it out. It is BEAUTIFUL. At first I was skeptical, but after watching the video, I was HIGHLY inspired! So off to the garage I went to start working on a chair that I have literally had in my garage for over a year. Originally, I was going to recover it, but like I said before, I was dreading pulling all those tacks. Then I thought I would slip cover it. However, I haven't even had time to look at my sewing machine, much less use it. So it sat...and sat! Until I decided I would paint it. I finished it in 2 afternoons and evenings. Here is the chair in it's original state. I loved the lines of the chair and KNEW it had potential, but lets be honest...that has got to be the U-G-L-I-E-S-T fabric ever! ESPECIALLY with this chair. WHAT were they thinking? I knew I needed to use a dark colored paint to go over the dark plaid. I decided on CeCe Caldwell's Hershey Brown. It took 3 good coats and a half a quart of paint. Once that dried...which by the way, really didn't take that long. I did have a fan going in the garage since it was 103 degrees outside. That may have helped speed up the drying process. I painted the arms and legs in CeCe Caldwell's Sante Fe Turquoise...2 coats. And then began stenciling the all over pattern with the same color. Once the Satin Finish was dry, the brown almost took on the look of leather! I was so excited at how this chair turned out. Much better than I could have EVER imagined, especially painting fabric. The best part of all of this....the chair is COMPLETELY kid friendly and pet friendly. Makes me want to Satin Finish all my furniture, but I won't! It's recommended that the Satin Finish cure for 30 days before subjecting it REAL wear and tear, but I had to try it out. So I poured some water on the seat! It beaded up and wiped right off. It can't get ANY better than that! It's even Aurora approved! And those tacks I was dreading...ended up being the best part! I love the way to antiqued brass looks with the brown and turquoise! I will point out...this process DOES NOT work with laytex paint...that is what I used in 1997. 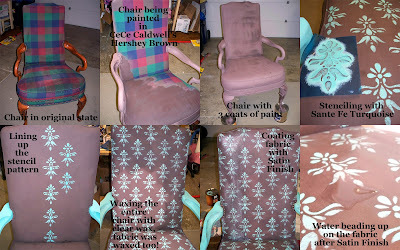 I would NEVER had even entertained the thought of painting fabric if Debi Beard had not inspired me to do this! However, I will DEFINITELY be doing this again in the future! I like to re-upholster, but sometime you just don't want to take the time! This is a great alternative that looks FABULOUS with the use of CeCe's paint! Update: Please note I don't think this process would work well with any sort of "fuzzy" fabric, like velour, chenille, velvet, etc. But who knows...it might, I just haven't tried it. This chair was cotton fabric. I found this cute little foot stool at the Goodwill about a month ago. I have been very busy as of late with everything BUT our booth space and this blog. Last Thursday I had a little bit of time to work on a small project so I decided the stool would be my project of choice! Easy enough to complete in a couple of hours. I had an old vintage table cloth that I wanted to use to recover the top. I couldn't decide if I wanted to use blue or green to paint the bottom. In the end...I decided on GREEN...my favorite color! However, I didn't have the perfect shade, so I had to create the "Pea-R-Fect" shade. Summer PEAS...that was the color I wanted. I custom mixed CeCe Caldwell's Maine Harbor Blue and Spring Hill Green until I got the perfect shade. I wish I could tell you the exact amounts, but I did not measure. I can tell you I started with approximately a 1/2 a cup of Spring Hill Green and I would guess I probably used about 2 Tablespoons of Maine Harbor Blue...but this is a guess. I coated with 2 coats of my custom mix and let dry. 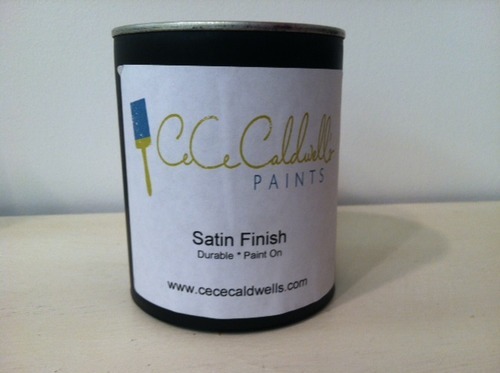 Then I sealed the stool with CeCe Caldwell's Satin Finish. If you have not tried this product yet...you are missing out! It's like brushing on liquid wax. When it dries...it has the perfect sheen and is completely durable and washable! Perfect for a tough finish if you don't want a distressed finish or need it to be kid friendly and washable. Great for table tops and kitchen cabinets! I can't say enough about how much I love this product! While the paint and the Satin Finish were drying I recovered the top using a vintage table cloth. This is the end result! It just makes me happy to look at it! I love the bright colors! I love the colors in this fabric!